Work Out Everyday – Everyone knows the gym is packed today. New memberships must be sky high on the day after New Year’s and understandably so. But every year the crowd seems to thin out and there’s an extra treadmill or two come March and April. If this is you, you’re not alone. You probably even have a close friend in the same boat, get them to push you and vice versa. The gym is always better with a friend anyways and you’re less likely to drop out when someone’s sweating it out with you. Lose weight/Diet – This sometimes goes hand and hand with the gym, but maybe you just want to eat better. Whether its a few pounds or a lot, it’s never easy. There’s still holiday food circling the office here, so we know its tough. Maybe its time to put those sweets away now that the family is gone and get back to more veggies and green stuff. We’re right behind you… just one last cookie though first. Quit Smoking – Another tough one and probably the most common resolution behind losing weight. No tips for this one, you just got to go for it. And if you quitting smoking and resolving to go to the gym more, not smoking can only help your treadmill times, right? Any others? What resolutions do you have this New Year? And are you still keeping to them? It’s never to late to get a resolution and it’s still too early to quit! Happy New Year and here’s to all your resolutions! 2,000 Likes of Tungsten World on Facebook: That Was Fast! Seems like just the other day our TungstenWorld.com Facebook page was approaching the 1,000 “like” barrier, and now we have 2,000 “likes”? Amazing! It may be the slow season for weddings, but it just goes to show you that tungsten carbide makes a great gift these holidays. Whether it’s tungsten rings for men, tungsten jewelry like bracelets and pendants or tungsten cufflinks, you’ll find something for everyone on your holiday list at TungstenWorld.com. And we’re even having great specials all season, including our extended Black Friday Sale going on now! Congratulations to Our Tungsten World Reviews Contest Winner!!! Congratulations are in order for…..Walter M. in Australia! “The website was great to use and easy to search through the large range of rings, with real to life photos. The fitting advice was perfect for the style of ring. Initially I searched through some local jewellers stores, but purchasing from Tungsten World ended up being easier, faster and cheaper, with the large range and excellent service. The service couldn’t have been any better and the ring was at my doorstep from the other side of the world (AUS) in under a week! I picked this online store due to the other reviews about great customer service and also the 45 day fitting policy, but I didnt have to use these as everything was perfect.”– Walter M.
Thank you to Walter for your review, and to everyone that sent in a review and participated in the contest. Your reviews of your tungsten rings and tungsten wedding bands help us to better our products and homepage, while continuing to provide you with the highest level of customer service. So, thanks again and congratulations, Walter! Remember, we’ll be doing these review contests every quarter. The next drawing will be in January. So, if you haven’t already, order your tungsten rings and tungsten jewelry, and get those reviews in for a chance to win! Summer and the wedding season have kicked off, and Tungsten World is leading the way with the highest quality tungsten wedding bands and tungsten rings, allat the best prices and with the most extensive policies. And this summer, we’re bringing our customer’s even more with new styles from our Tungsten Forever‚Ñ¢ line of tungsten rings. We’re also anxiously anticipating the upcoming 4th of July holiday and a well-deserved day off to celebrate America. 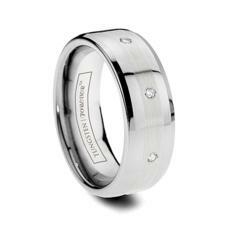 Celebrate with us by choosing our “made in America” inlay tungsten rings and diamond tungsten rings. In response to the devastation experienced in Japan following a March 11 earthquake, Tungsten World joined many in the U.S. in their concern and sympathy for those affected, and vowed to donate a portion of the proceeds from their tungsten rings and tungsten wedding bands sales to Japanese relief. We are proud to announce that with the help of our customers, Tungsten World was able to make sizable donations in both March and April to the Red Cross. Donations were sent on April 4 and May 9, and funds were directed towards sheltering those displaced by the disaster near the Fukushima nuclear plant. From all of us here at TungstenWorld.com and on the behalf of the Red Cross and Japan, we would like to thank you for contributing with your purchase of our tungsten carbide rings and tungsten carbide jewelry.